This is part of a series of blogs highlighting how federal agencies use spectrum to carry out important missions for the American people. When a large wildland fire breaks out, federal agencies have a number of tools at their disposal, from “smokejumpers” who can parachute into remote areas to airtankers that drop fire retardant from the sky. But those various tactics would be ineffective – if not outright dangerous – without a communications infrastructure available to firefighting crews. 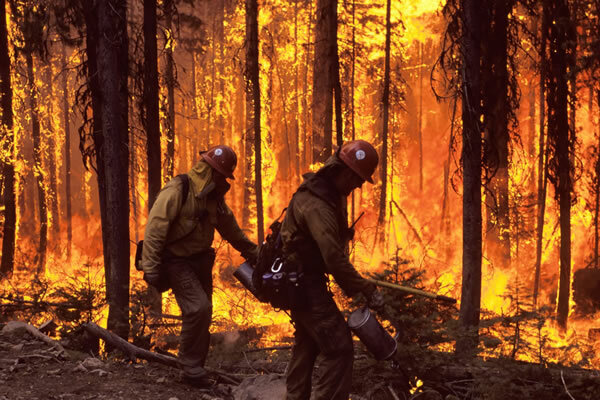 The National Interagency Fire Center (NIFC) and the National Interagency Incident Communications Division (NIICD) are responsible for coordinating communications when federal agencies are managing wildfires. A week ago, NTIA announced that the proposal developed by the Internet multistakeholder community to transition the U.S. Government’s stewardship role for the Internet Assigned Numbers Authority (IANA) functions met the criteria NTIA outlined in March 2014. The announcement was an important milestone in the U.S. Government’s effort to complete the privatization of the Internet’s domain name system. The transition will help ensure the continued leadership of the private sector in making decisions related to the technical underpinning of the Internet, which has helped the Internet thrive as a platform for innovation, economic growth, and free speech. NTIA worked with other U.S. Government agencies and conducted a thorough review of the Internet community’s proposal to ensure it met our criteria. NTIA also found that the proposal adequately addressed relevant internal control principles, in a review recommended by the U.S. Government Accountability Office (GAO). In addition, a panel of corporate governance experts concluded that the plan is consistent with the sound principles of good governance. From Internet-connected fitness bands and watches to security systems and thermostats, Americans are beginning to use Internet-connected devices, appliances, and objects that are part of a growing category of technology known as the Internet of Things (IoT). The latest computer and Internet use data collected for NTIA shows that the number of Americans using IoT devices is still small. But we are seeing an interesting snapshot of early adopters. These new insights into how Americans are utilizing IoT are drawn from data collected in July 2015 as part of our Computer and Internet Use Supplement to the Census Bureau’s Current Population Survey. As we previously noted in April, few Americans—just 1 percent—reported using a wearable, Internet-connected device, such as a fitness band or watch, as of July 2015. While the market for this type of device is clearly in its early stages, we found notable differences between early adopters of wearable technology and the population as a whole (see Figure 1). Unsurprisingly, wearable device users exhibited many characteristics associated with higher levels of computer and Internet use. Wearable device users tended to have higher education and family income levels compared with all Americans, and they were more likely to live in metropolitan areas. More than a year ago, President Obama asked NTIA to convene stakeholders to help develop best practices to address privacy, transparency and accountability issues related to private and commercial use of Unmanned Aircraft Systems (UAS). I want to join Commerce Secretary Penny Pritzker in congratulating the stakeholders who reached consensus yesterday on a set of best practices that will help guide the development and growth of UAS in the United States. I also want to thank everyone who put in the many hours of work throughout this process. Multistakeholder processes only succeed through stakeholders’ dedication, hard work and willingness to compromise. UAS holds the potential to provide significant benefits to both industry and consumers in myriad ways. These include using UAS to inspect cell phone towers without risking human lives, monitor crop growth and take aerial photos of real estate. The best practices agreed to by a diverse group of stakeholders -- including privacy and consumer advocates, industry, news organizations and trade associations -- represent an important step in building consumer trust, giving users the tools to innovate in this space in a manner that respects privacy, and providing accountability and transparency. This fall, NTIA will be joining the U.S. delegation, led by the U.S. Department of State, to an international conference that will consider issues that could impact international telecommunications standards and Internet-related policy issues. NTIA is currently engaged in a collaborative process with the State Department to develop formal U.S. proposals and positions for the International Telecommunication Union’s World Telecommunication Standardization Assembly (WTSA), which takes place every four years. The WTSA, which runs from October 25-November 3, will set the overall strategic direction for the ITU’s telecommunications standards (ITU-T) work for the next four years. As the President’s principal advisor on telecommunications and information policy issues, NTIA promotes policies that will help the Internet and the digital economy continue to grow and thrive as a platform for innovation, economic growth and free expression. Given this mission, NTIA wants to ensure that its contributions to the U.S. preparatory process result in proposals to the WTSA that accurately reflect the views and concerns of U.S. businesses and consumers about the Internet and the digital economy and also will help support economic growth and innovation. We also want to ensure that the work plan agreed upon at the WTSA related to upcoming ITU-T work does not duplicate the standards development processes of other bodies. NTIA’s analysis of recent data shows that Americans are increasingly concerned about online security and privacy at a time when data breaches, cybersecurity incidents, and controversies over the privacy of online services have become more prominent. These concerns are prompting some Americans to limit their online activity, according to data collected for NTIA in July 2015 by the U.S. Census Bureau. This survey included several privacy and security questions, which were asked of more than 41,000 households that reported having at least one Internet user. From the thriving tech hub of Seattle to the small mountain town of Silverton, Colo., communities around the country understand that broadband access and adoption are essential to staying competitive in the 21st century. A high-speed Internet connection combined with relevant digital skills can unlock a range of opportunities for residents, including better job prospects, access to educational and health care resources, and discounts on goods and services. As local leaders take on the challenge of expanding broadband in their communities, NTIA is here to help. Our BroadbandUSA program is harnessing the expertise we gained overseeing the $4 billion in grants issued through the Broadband Technology Opportunities Program (BTOP). Through technical assistance, regional workshops, guidance and resources, BroadbandUSA is building on the lessons learned from across our grant portfolio to support communities as they seek to build infrastructure, pursue public-private partnerships, or increase adoption.